This recipe is easy! Watch the video. Give me all the tacos. There’s something about the crunchy shell and the warm filling that has me dreaming about Taco Tuesday all week long. But once in a while I try to include some new flavors in our dinner menu to keep my kids engaged and trying new things. 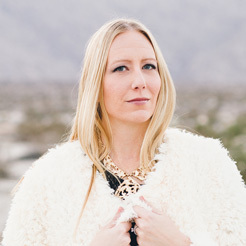 I have one adventurous eater and one picky eater, and tacos always seem like the perfect food to bridge that gap. 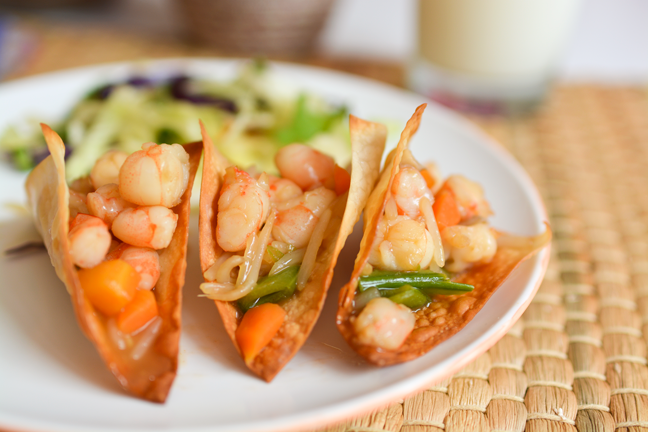 These Asian inspired shrimp wonton tacos are a fun idea to share with your kids. Plus everything just tastes better when it’s mini, amiright? Move over, tortilla chips. When baked, wonton skins get crispy and golden brown. They taste just like a fried, crispy shell without any of the deep-fat-fry guilt. I add in shrimp and some stir fried vegetables for a delicious new version of tacos that are super simple to make. This is one of those recipes where you can substitute your favorite ingredients and make them exactly to your liking. If you have a favorite stir fry sauce, by all means, use that. And if you’d prefer to use fresh veggies, do it! Aside from the fresh bean sprouts I used (which you can totally skip in a pinch), the ingredients for this dish can be kept on hand for those nights when you didn’t have time to plan ahead for dinner. We could all use a few more meals like that. This recipe can easily be doubled based on the number of family members you are trying to feed and how hearty you want your entree to be. This is one of our go-tos for taco night! Step 1: Thaw your shrimp per package directions. Remove tails, if on. Step 2: Preheat oven to 350 degrees. Brush wonton skins lightly with oil on one side. Spray the inside and outside walls of a deep square pan with nonstick cooking spray, then drape the wontons over the walls of the pan to form triangular taco shells. Step 3: Bake for approximately 6–8 minutes. Remove and let cool. Step 4: Bring water to boil in a small saucepan. Add shrimp. Cook for 2–3 minutes until just opaque. Remove to colander and run cold water over them to stop the cooking. Do not overcook. Step 5: Place frozen vegetable blend and bean sprouts in a microwaveable dish and thaw in 30-second increments. They should be cooked until heated through but still tender. Pour off any liquid. Step 6: Rough chop the shrimp, vegetables, and bean sprouts and return to microwaveable dish. Step 7: Add stir fry sauce and stir to coat. Step 8: Spoon shrimp mixture into mini wonton taco shells.